The youth group of the Zionist Camp protested outside the Prime Minister's Office, demanding a 'long-term solution' to terror. While right-wing groups have been protesting throughout Sunday demanding that the government get tougher on terrorists, the youth group of the left-leaning Zionist Union (Labor Party) protested outside the Prime Minister's Office as well. According to the protesters, the recent terror wave in Jerusalem, Judea and Samaria is the fault of Prime Minister Binyamin Netanyahu – who is responsible for the terror wave because he is not accommodating enough to Palestinian demands. “The right tells us that none of this is their fault,” said Uri Keidar, chairman of the youth group. “What do we hear from the right-wing ministers and MKs? Nothing more than excuses. We must find a long-term solution to the conflict,” which, according to the group's philosophy, would require Israel to give up Judea, Samaria, and most of Jerusalem – the price the Palestinians demand for a treaty with Israel. 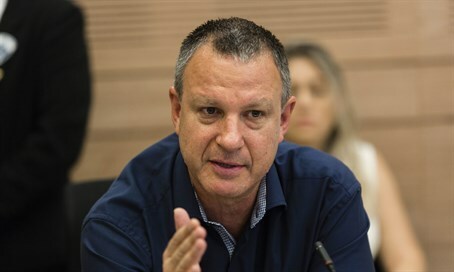 MK Erel Margalit, a Jerusalem resident, demanded that Netanyahu step down immediately. “The only thing Netanyahu talks about is Iran, while Jerusalem is the target of the terrorists. Anyone who isolates Israel on the international stage cannot keep Jerusalem unified. Netanyahu is taking Jerusalem 15 years in the past, and irresponsibly forsaking the city's security. If the Prime Minister is not up to the job, he should leave it. We will know how to replace him and keep the city unified,” Margalit said. The protests took place after a difficult night in Jerusalem, in which Rabbi Nehemia Lavi, 41, and Aharon Banita Bennett, 21, were both murdered in a terrorist attack Saturday night. Bennett's wife, Adelle Banita, 22, and their two-year-old son were also injured. Later Saturday night, an Arab youth stabbed a Jewish teen several times near the Mamilla shopping center in Jerusalem. The teen was taken to the hospital in moderate condition. Security forces shot and killed the stabber.